Yesterday, 2/28 was International Rare Disease Day. Most rare diseases are genetic, chronic, serious, and debilitating. You can watch the 2014 video below, as well as check out the Rare Disease website here and find out if your disease is rare. My rare disease is Cushing's Disease. 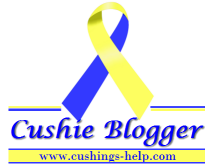 I am a survivor of Cushing's Disease. Many of these rare diseases are treated in help with the Orphan Drug Act, which gives pharmaceutical companies grants to develop drugs that can help people with rare diseases. You can read more about the Orphan Drug Act here. I hope you all have a great weekend, I'll be back next week with more information on my Cushing's talk at Harvard Medical School! Where Do You Follow Me?